Web form - eBay & Paypal user names & passwords, credit/debit card, SSN, etc. 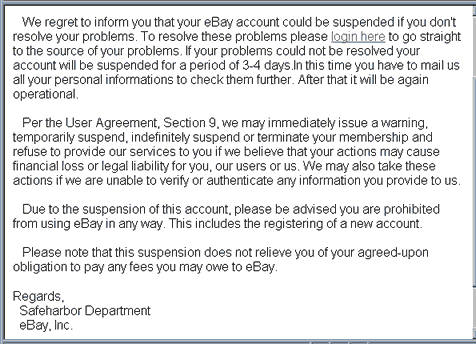 The spoofed email suggests that your eBay account could be suspended due some violation of policy, then goes on to suggest that it has been suspended and requests that you update your account information using the link provided within the email. which is hosted by hyoermart.net in Burlington, MA, USA. If you provide this information and submit it, it is captured and forwarded via response-o-matic.com's mail form processing service (response-o-matic have closed this account down and they should be commended for their swift response to this abue of their service).